One of the contributors to this blog, Ingrid, has alerted us to the horrific train crash near Santiago de Compostela. At this stage it’s unknown how many people have died, but they’re estimating in excess of 50. No doubt the train would have been full of pilgrims and others coming into Santiago for the celebrations on St. James Day, on July 25th. Please send your thoughts, your prayers, your energies, your light, to all those who are being affected by this truly shocking tragedy. Thanks Bill. What else can be said? My prayers are going out for those affected. my daughter, while she was living in Madrid, used to take that train all the time. Very close to home, for many of us, I’m sure. Terrible news; so very, very sad – particularly just before St James Day. I add my prayers. this brings tragedy very close to home. That’s a train many of us would have, or would be likely to travel on. The high Speed Renfe train from Madrid to Santiago. I took that train from Leon into Santiago last year….Very close to home. I am sending Love and Light to all those involved. So sad! My thoughts and prayers are with those injured and with the families of those who did not survive. Such a horrific tragedy. P.S. Bill: The photo you selected was gorgeous, and so very appropriate at this sad time. that’s in the Cathedral in Santiago. I’ve been watching news footage here. So sad….praying for all connected to this tragedy!! What horrible news to wake up to. Here it is now just before 7 am and we are waiting for the latest news from Spain. As you said, this really hits home for so many of us. I haven’t walked the Camino yet but will be in Spain in about 5 weeks and will probably take a train out of Santiago. I do not pray but all of my thoughts will be with all of those affected. Yes, it’s said to be the worst train disaster in Spain’s history. Keeping the families of all affected in my prayers. It’s amazing how after having walked the Camino and spending time in Santiago this train accident is affecting us as Pilgrims – it feels so much closer to home. Yes, Sandy, my thoughts exactly when, out in the car earlier today, I too heard the news. All sorts of images of being on the train in Spain on my way to start my walk flashed through my mind and it’s amazing how close you feel to something happening that far away, because you can see yourself in that spot, in that moment. I feel the same way. It’s come as a real shock, and I’ve found it very upsetting. There is something very personal about it. I heard this terrible news on my way to work this morning and was shocked, saddened and could not believe it. The victims, families and survivors have been in my prayers and on my mind all day. A few weeks and I’ll be there. May the victims be welcomed into the loving embrace of God and their families receive comfort and support. Let the candles of love continue to burn. Bill, thank you for your very sensitive and appropriate photo selection. It’s almost unimaginable, particularly the timing. 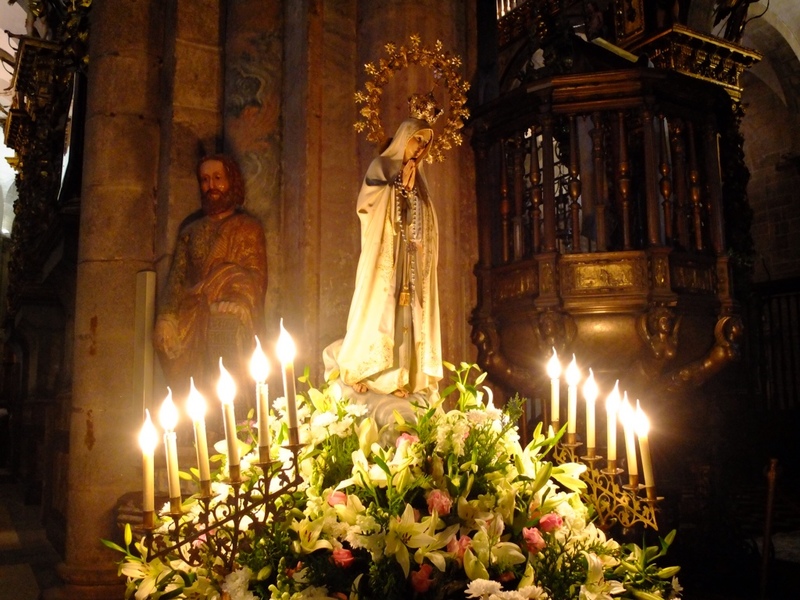 The candles are in the Santiago Cathedral. This is the train I’ll be taking in just two months. I’m so saddened and horrified. My prayers to those affected.